Disney Publishing has announced it will publish a new series by bestselling author and illustrator Mo Willems. The series is called Unlimited Squirrels. 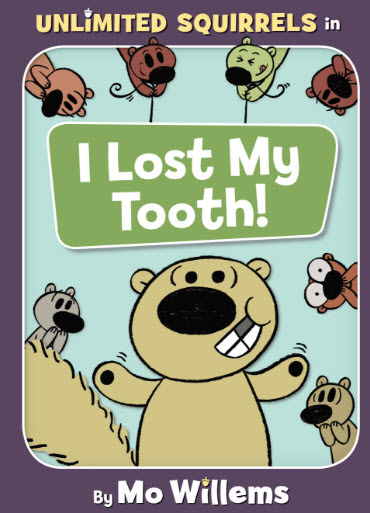 The first book in the series, I Lost My Tooth!, will by published on October 2, 2018. Willems is the author of the Elephant & Piggie series. He has received the Caldecott Medal three times. The award winning titles include Don’t Let the Pigeon Drive the Bus!, Knuffle Bunny: A Cautionary Tale, and Knuffle Bunny Too: A Case of Mistaken Identity. Willems got his start as a writer and animator on Sesame Street. The Unlimited Squirrels series features a cast of squirrels, acorns and guests. The books will each include a funny adventure, jokes, quizzes, fun facts and more. Willems says in the announcement, "I'm excited about creating these new Unlimited Squirrels adventures with my longtime team at Hyperion Books for Children. I hope these books will resonate with young readers who love funny stories, interesting facts, silly jokes, and an overabundance of squirrels."